Deep thoughts and Czech pilsners at Paprika. 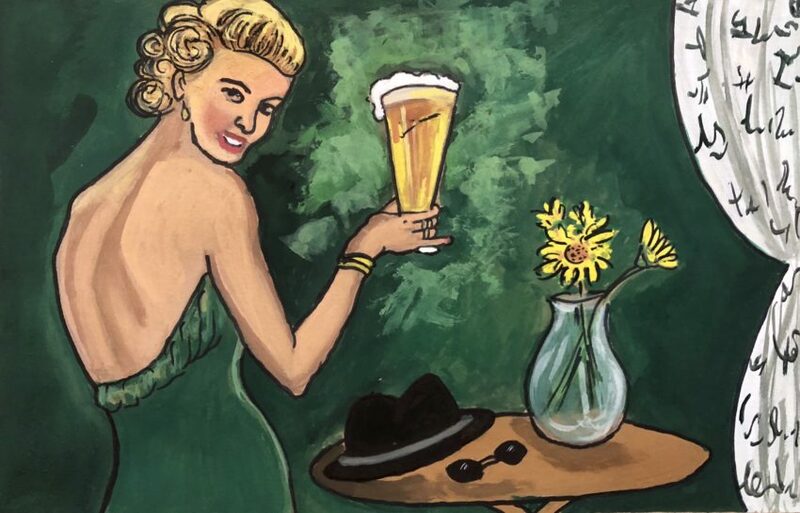 Art by Molly Oleson. Paprika, which was described to me as “an Eastern European-themed gastropub” on 24th off Mission, really does have the atmosphere of a cafe in a formerly communist stronghold that’s occupied by leftover revolutionaries and hard-up intellectuals. It’s a small room with just a few tables, feels a little run down, and — on a recent visit — featured a strange and weathered old man with a beard and a scarf sitting at the very small bar for no clear reason. When you walk in and see him staring into space, you ask yourself, “is he thinking something profound? I bet he is.” If you saw this man sitting on a park bench, you would not give him the benefit of the doubt. The small party at a nearby table also featured someone with a beard holding forth on the decline of San Francisco. The trouble with classic Eastern European communist holdover cafes is … they’re usually pretty terrible. The fact that Paprika was fairly crowded early on a Wednesday night made me hopeful that it would display some hidden talent, some special gift — and, in fact, it got absolutely bustling for almost 90 minutes that night, with the small and charmingly apathetic waitstaff clearly working harder than they signed up for to keep up with the rush. I found a table and looked at the menu. It was … small. Just one page, double-sided, with a few food options on one side, and a few beers and wines from the Czech Republic and Hungary on the other, both in large type. There was no point in studying the menu — it was its own flash card. I got a Czech Pilsner (let’s please not pretend that we know enough about beer to really tell one Czech Pilsner from another by name alone — this one was golden and only slightly hoppy) and settled in with a book. Michelle came in and joined me 10 minutes later. She ordered a beer, too, and we began talking about big art events that have recently happened. “Life is … extra weird … right now,” she said. And there you have the San Francisco underground artist’s conundrum, circa 2018: We can’t create the underground events we most want to because we’re too damn tired from putting on the underground events we most feel obliged to. The scene isn’t dead, it’s just exhausted. “Is it that hard to find Czech beers?” Michelle asked. We ordered another round or two, we kept talking, and gradually Paprika emptied out around us. We told him what we’d ordered, then added one more round, and sat a while longer. We couldn’t tell you a single reason to really like the place, or why so many people obviously seem to, but the fact is — we had a great time. It’s somehow a perfect spot to linger with a friend over a very limited selection of moderately exotic beers and wine.